Photography, when exhibited, gives you this magnificent feeling… It absorbs you into the moment… It recreates stories even if you have never been there… It even creates the sounds and the smells of the place and puts you in-between the lives of strangers, as a member of their families. And photography leaves you in a state of alert for what’s around the corner, just outside the frame! I don’t know if you have experienced it. But I just did. 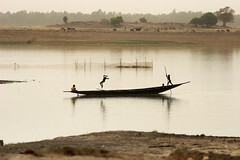 I am writing this post as I came back from the Travel photography exhibition of good friend Ilias Hatzakis. Ilias is a colleague working on promoting technology, much as I do. But to me, he has always been a talented photographer with a unique gift for capturing moments. Year after year, our discussions escaped technology and drifted on photography. To my eyes he is among the top Greek Travel Photographers. For all his modesty, he thinks it’s just a hobby. But he is wrong. Ilias’ photos are bursting from life. Each one, within its borders, is a small act of play. The actors, the audience, the plot are all within the frame and are depicted magnificently, with the vibrant colors and the expressive faces that he can capture. I have always admired Ilias’ work. He was always generous to share it with the world on his Flickr account. But there was always a pitfall: the computer screen. Today, I had the privilege of visiting Ilias travel photography exhibition alone, beyond the normal “bustling” schedules so that I could absorb the stories as he has framed them. Families from Burkina Faso behind windows overlooked me, describing their lives through their eyes and pitiful smiles. Children playing at the dusty roads of Mali and India, greeted me. 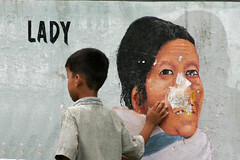 People from Nepal and Tibet stared at me with their wrinkling eyes full of curiosity. People of struggle welcomed me in their daily fight to prepare for their next day, selling things at the local flea markets which are setup wherever there is life… Ilias’ captures led me away. Large prints, although smaller than I would have preferred for his work, drew me into them! And this time, the colors and the excellent prints, accentuated his work. The barrier of the computer monitor is no longer there. It’s hard to explain but I have a sense of relief. Many friends have attended the exhibition and praised my friend for his absolutely stunning work. But it’s not that fact which makes me happy… It’s rather because I believe that this exhibition is not just a showcase to the public. For me, it’s a moment when Ilias decided to embrace his own pieces of artwork with the respect that they deserve. He has always been the harshest critic of himself, but today it’s as if I have seen him giving a broad smile to his treasure. And hopefully this paves his next step, on his course to being acknowledged as a top Greek travel photographer, with a unique vision. If you are around Athens, be sure to visit Ilias Hatzakis travel photography exhibition at Bartessera, until the 2nd of May 2011. As a photographer I have been using Facebook extensively to connect to friends, share photos and even create my official Facebook page for my Wedding and Travel Photography business. I have always adhered to some basic rules when posting photos so that I can be on the safe side, namely I watermark lightly with my name and I always post at low resolution. It goes without saying that I don’t care if someone shares my photos, re-posts them as is etc. That’s the point of social media after all isn’t it? For those oblivious to mention the source, I don’t care that much as the watermark does its job of reminding them! 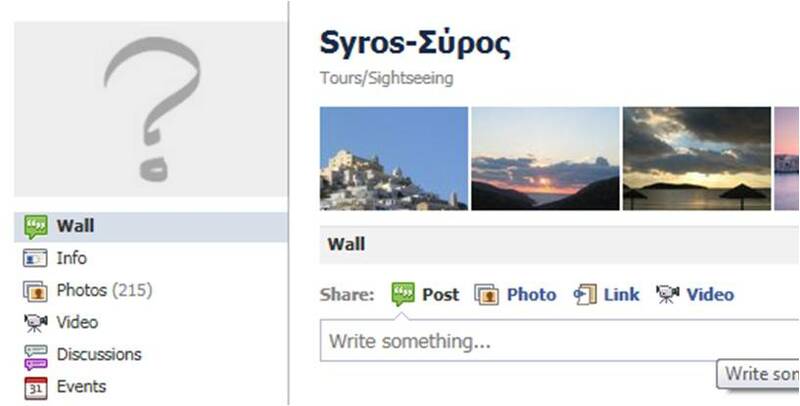 So I came across a Facebook page entitled Syros-Συρος that had some of my photos re-posted without references etc. but no problem! No issues for me as long as they are respected as “complete” works. I didn’t care for the lack of reference. But then, judging by the number of “Likes” that my Ermoupolis photo (shown above) collected, the anonymous administrator goes forward, crops the photo, removes the watermark and makes it his Page profile photo! Oh really? Now, that made me furious. I left a message but in vain! They did not care to answer. I reported the issue to Facebook, by using their copyright infringement reporting tools, highlighting all aspects of the issue. To my positive surprise, Facebook reacted within almost eight (yes 8!!!) hours and took the profile photo down, leaving him with a question mark instead, as profile photo. For me, that is an exceptional case for showcasing that Social Media (and Facebook of course) can indeed be platforms for safe sharing of your works, as long as you do take your own precautionary measures. Kudos Facebook for your prompt reactions and thanks for caring for our photography! You know that I always admire talented people and their art! This post is to highlight the art of Emmanouil Papadopoulos, entitled “Athens | The Little Great City“. A magnificent work that (presumably!) uses a tilt-and-shift lens, time lapse techniques and uniform color correction to highlight the city I live in: Athens, Greece. Thank you Emmanouil… And Kudos! Rare talent! You have me watching this again and again…. 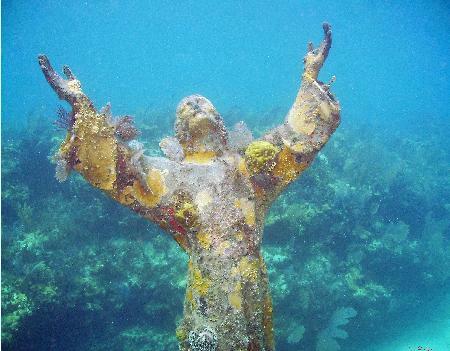 Christ of the Abyss is a 8 1/2 foot, 4,000 pound bronze sculpture of Jesus Christ that stands in 25 feet of water off of Key Largo, Florida. It is located near Dry Rocks, about six miles east-northeast of the Key Largo Cut, in the John Pennekamp Coral Reef State Park. It is a copy of “Il Cristo degli Abssi,” located in the Mediterranean Sea near Genoa, Italy. The original statue was cast by artist Guido Galletti, and was modeled after Italian swimmer/diver Duillo Mercanet. The statue was placed in 1954, near the spot where Dario Gonzatti died in 1947. In 1961 Italian SCUBA entrepreneur Egidi Cressi commissioned the second casting from the original mold, and donated it to the Underwater Society of America. The statue ended up in storage at O’Hare airport in Chicago, waiting for a home. Senator Spessard Holland of Florida helped John Pennekamp Park to get the nod, where it was placed on August 25, 1965. Today, Christ of the Abyss is one of the most famous and popular underwater sites in the only underwater park in the world. Due to increasing amounts of corrosion and the growth of crustaceans, the statue was removed from the water and restored in 2003. A hand that had been detached by an anchor was also replaced. The statue was returned to the water with a new base on 17 July 2004. I have also found this magnificent atmospheric youtube video that depicts the feeling. 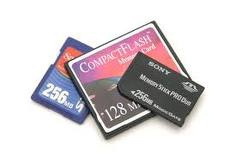 All of us, just slip a memory card into the camera and shoot photos without second thoughts! But do you know how much effort goes behind a “simple” memory card that holds all our memories? Lexar has prepared a great video! As an Electrical and Computer Engineer, I am amazed by digital photography due to its artistic aspects but also due to its technical wizardry! Watch and enjoy! To all my friends around the world I wish a Happy 2011 full of opportunities that you grasp! My first post for this New Year is about the people who work countless hours behind the scenes to document history as it happens. Pete Souza is the US President’s Photographer and shoots 24/7 wherever the President is and goes! Enjoy the documentary! I am sure you have watched and enjoyed the Google viral video about “Parisian Love“. Now, Google and youtube offer you an ultra easy-to-use online tool to help you create your own “Google search” videos in a few minutes! All you have to do is make up your own story as a sequence of “Google searches” and then define what kind of results you want (typical search, maps, images etc.). You can preview the short clip, then select the music and voila! Of course it aims at promoting Google capabilities more than you, but hey! it’s fun!